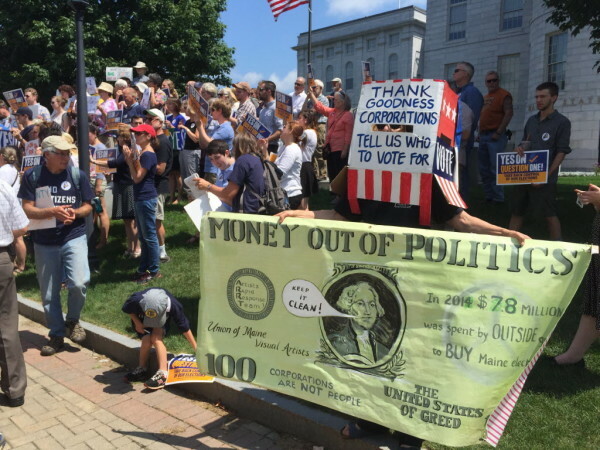 Dozens of volunteers and activists turned out at the State House to kick off the Yes on Question 1 campaign, spearheaded by Mainers for Accountable Elections, which supports campaign finance reform, July 28, 2015. AUGUSTA, Maine — Supporters of an election reform effort on the November ballot have used Republicans as central representatives for their campaign. But that pro-Question 1 campaign, which has raised more than $1 million, has largely been funded by Democratic donors, including a group linked to billionaire progressive George Soros. That big money has helped spark conservative opposition to the question, which is aimed at getting big money out of politics by expanding allocations to Maine’s taxpayer-funded election system from $4 million to $6 million every two years while adding transparency requirements to advertisements from outside groups and increasing penalties for election law violations. It all reflects growing polarization around the Maine Clean Election Act, passed in 1996. The law was used by wide majorities of legislative candidates in the first decade of the 2000s, but in recent years, participation has dropped off and skewed Democratic. Those divergent Republican voices, however, may be the ones who decide the campaign. Most of the pro-Question 1 campaign’s money has come from just a few liberal groups and donors even as Republicans have debated on supporters’ behalf. Mainers for Accountable Elections, the coalition of groups running the campaign effort, raised $1.3 million through September, with three-quarters of that coming from groups and people outside of Maine. Of that, $350,000 was from the Proteus Action League, a group linked to Soros. Another $200,000 came from Sean Eldridge, a New York investor and unsuccessful Democratic congressional candidate last year. Every Voice, another liberal group, kicked in $167,000 and film director J.J. Abrams and his wife, Brewer native Katie McGrath, kicked in $100,000. The coalition also is largely made up of liberal groups, including the Maine People’s Alliance and the Maine Education Association. But the group has called itself a “broad, grassroots coalition.” Sen. Roger Katz of Augusta, a moderate Republican, debated on its behalf on MPBN earlier this month, and former Republican Sen. Ed Youngblood of Brewer debated for them in his city. But Katz, a moderate, said the law hasn’t been partisan before and it shouldn’t be now. He said both parties have “equal opportunity offenders,” from Soros on the left to the Koch brothers on the right. “If anybody has a perception that big money flowing into Maine helps Republicans more than Democrats, they’re wrong,” he said. But Republicans have turned against taxpayer-funded elections in recent years as participation among the party’s legislative candidates has dropped steeply. The political action committee formed to oppose Question 1 is called Mainers Against Welfare for Politicians, which is Gov. Paul LePage’s favorite pejorative for the Clean Election system. For the 2008 campaign, 81 percent of Maine legislative candidates used the Clean Election system, but U.S. Supreme Court decisions in 2010 and 2011 weakened the law by repealing limits on outside campaign expenditures and outlawing “matching funds,” once available to publicly funded candidates outspent by privately funded opponents. Participation was 53 percent among legislative candidates in 2014. The number of Republican participants cratered. In 2008, 72 percent of Republican legislative candidates were publicly funded, but by 2014, it dropped to 26 percent. Participation among Democrats dropped, too, but only from 92 percent to 77 percent. Lockman, a Clean Election candidate when he won his first term in 2012, said he turned against the program after he realized that state government was underfunding nursing homes and other health services. “If I had to do it over again, I wouldn’t have run as a Clean Election candidate,” he said. He and opponents say that just about any use of public money is better than using it for campaigns. Katz said he understands that argument, but he disagrees.